“Sip ‘n’ Shop” Event THIS SATURDAY! 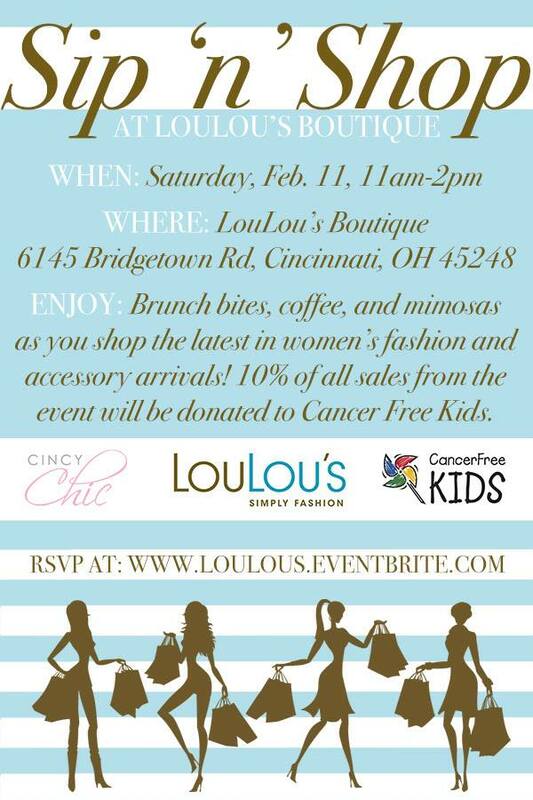 While the East Side of Cincinnati is hoppin’ with women’s fashion boutiques, there’s only one – LouLou’s Boutique – on the West Side of town (that I know of). So, as a proud West Sider, I had to partner up with them for an event to show them (and an important local cause) some love! The event benefits Cancer Free Kids, as a portion of all sales goes to them. So, I hope you’ll be able to find some time to make it over on Saturday morning, enjoy some mimosas with us, and shop for a great cause! More details below! ENJOY: Brunch bites, coffee, and mimosas as you shop the latest in women’s fashion and accessory arrivals at LouLou’s Boutique. 10% of all sales from the event will be donated to Cancer Free Kids.